The clients wanted to create a home where they could age with independence, convenience and style. Planning for the long term, the clients considered a future that involves entertaining friends, grandchildren visiting and the possibility of a live-in caregiver, every detail deserved careful time and attention. This project puts the "living" in living space! 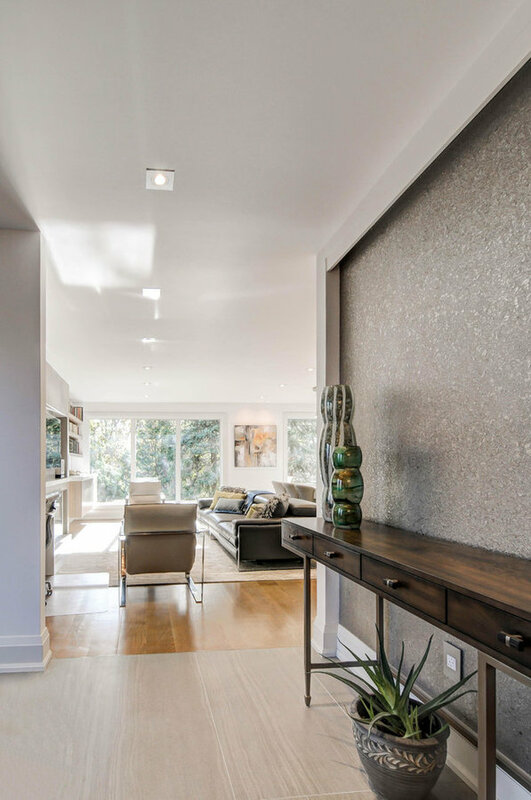 A texture wall covering set in a cover wall greets you at the entrance of the bungalow, highlighting the designs focus on key moments and localized features that creates a lasting impression. The foyer is wide, allowing natural light to flow through the space. 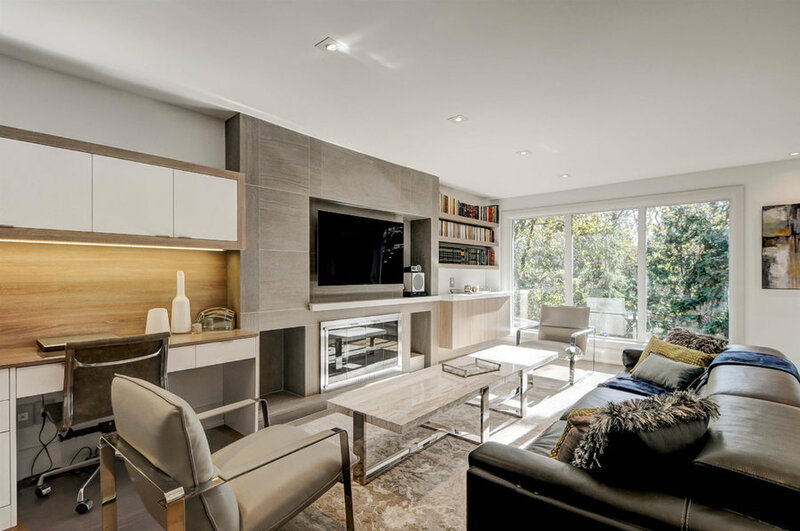 The living space is an important concept in this space, with a focus on easy entertaining and beautiful craftsmanship. 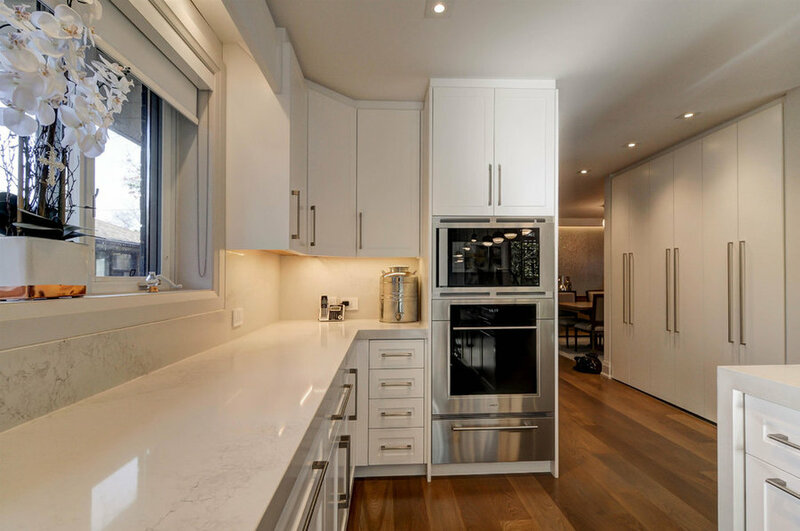 The kitchen had to be large enough not only to host guests comfortably but to also fit a large 5' wide stainless steel fridge within the custom cabinetry. All eyes are on the beautiful view of the ravine through the large windows, flooding the main living space with dappled sunlight. 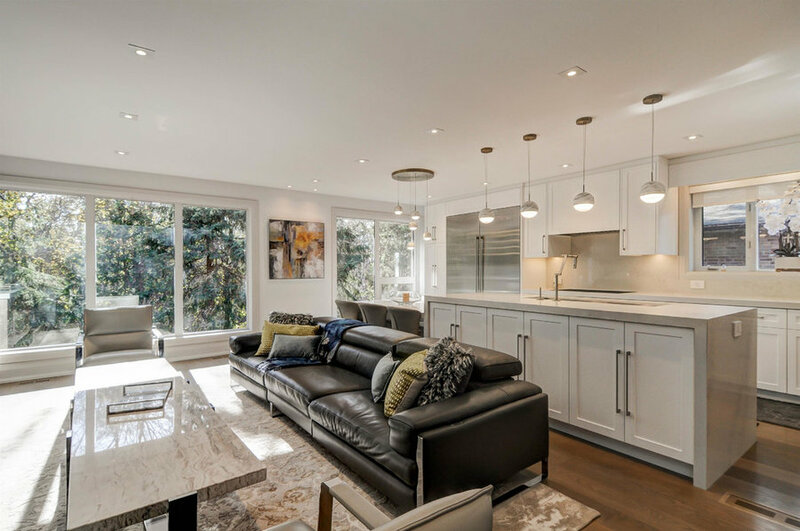 Sleek lines, polished marble, metal hardware and leather upholstery dominate this light filled living room. From here, the home owners can access their security camera and answer the door without leaving the comfort of their modern leather couch. 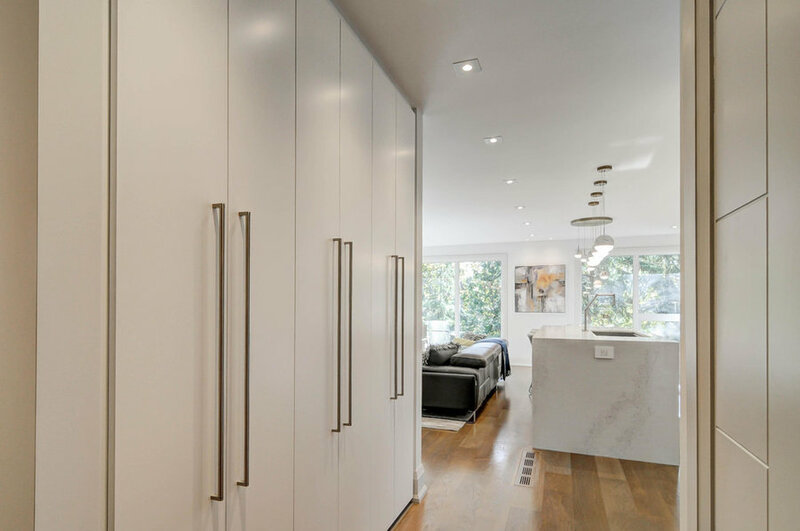 By introducing custom millwork through out the entire home, architectural features become the artwork. The living room wall transitions from bookshelf to fireplace and entertainment to a small and discrete work space. This wall is now transformed into a refined multi-functional feature wall. 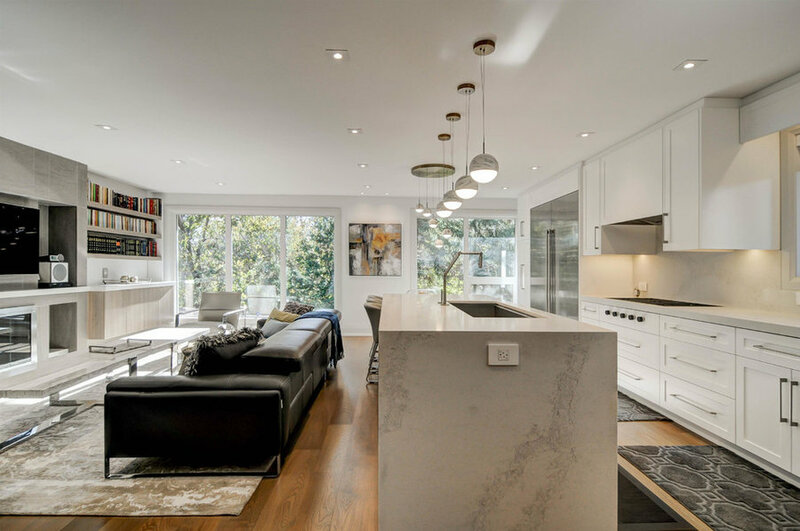 Pendant lights and pot lights illuminate the living space without distracting from the beautiful ravine view. 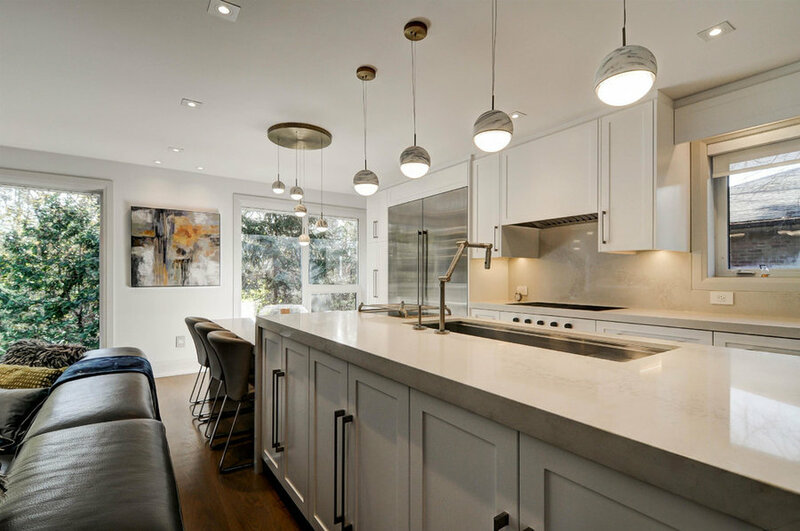 Custom cabinetry ensures there is plentiful storage so that the beautiful marble counter tops are the star of this kitchen redesign. The hallway offers more storage still, including the household's laundry area which was relocated from the basement to the main floor. Directly off the foyer is an ample dining room, ready to host friends and family. 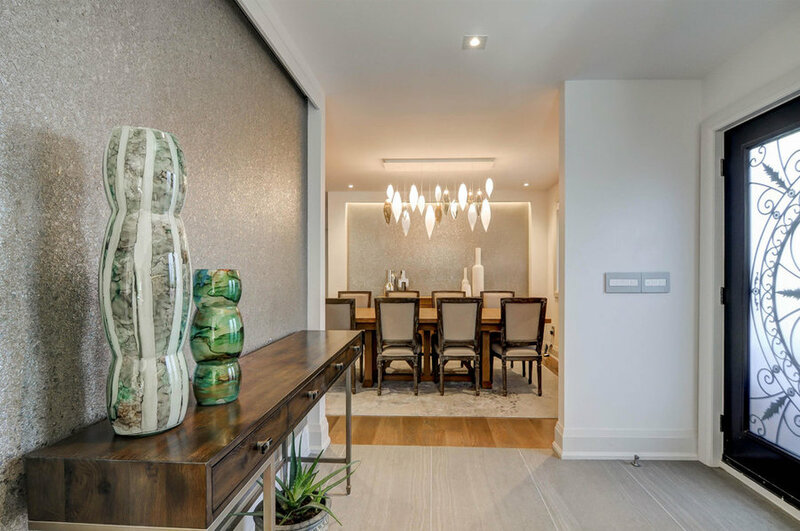 Cove lighting, a custom hand-blown glass light fixture and the glitter of textured wallpaper adds true glamour to the dining room, while light wood floors, an understated dining table and subtle dining chairs balance the elegant space with their muted and soft tones. 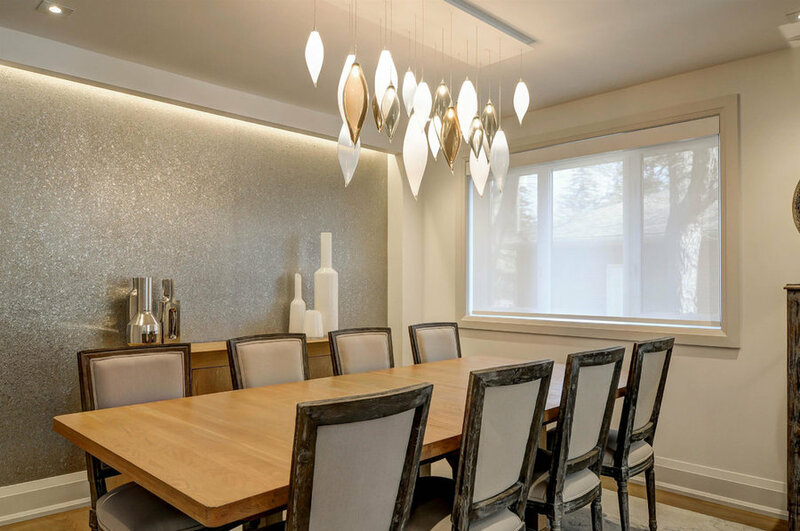 The hand-blown glass chandelier was made custom for the clients, a reflection of their appreciation for craft and beautiful design. Organic-shaped globes glow and illuminate the bright, open and intimate dining space. This small powder room feels spacious with it's built-in floating cabinet featuring hidden lighting and modern fixtures. 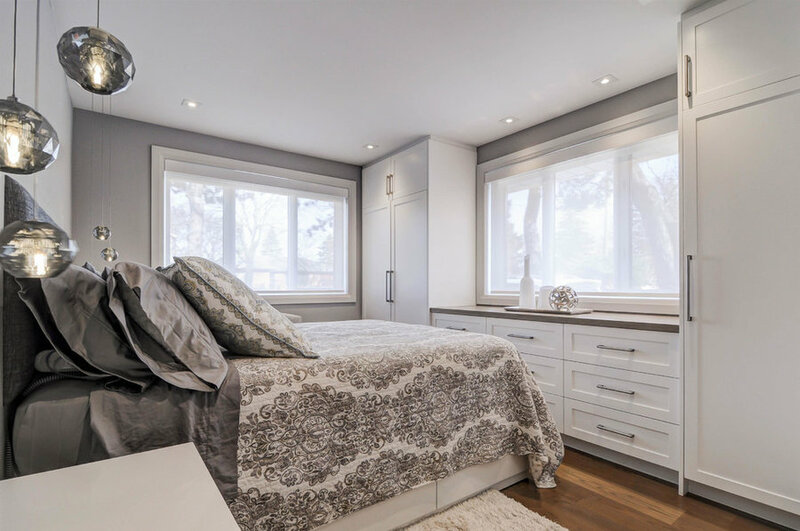 Tranquil and serene, the Master bedroom has ample storage space thanks to custom built wardrobes and dresser unit. 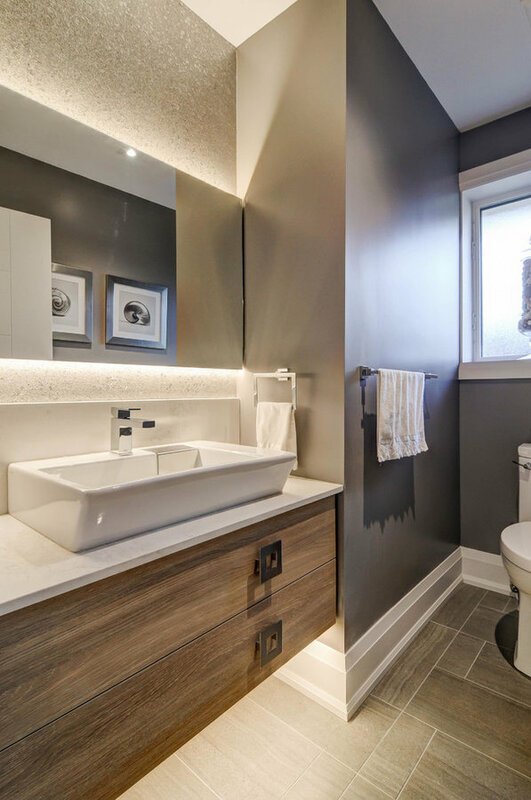 The en-suite bathroom features a walk-in bathtub and grab bars, as well as seamless flooring like the rest of the home to ensure it's wheelchair accessible. Jewel-like light fixtures and pot lights add sparkle to an already light-filled room.